Problem with entities and Doctrine cache? This is a simple guide on how to create and manage nodes using Roadiz CLI, add and remove node fields, or even how to import nodes. First and foremost, you need to create a new node-type before creating any kind of node. If you want to know more about what a node-type is, please visit the other section of the developer documentation. 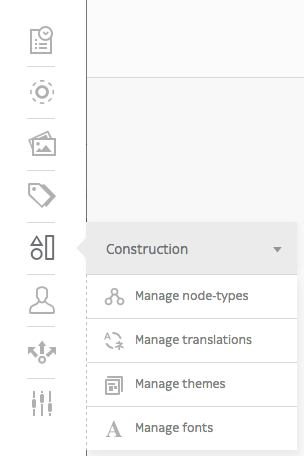 When working with Roadiz in the back-office, you can easily manage node-types via the Construction icon in the toolbar. Once you have landed on the Node-Types page (https://mywebsite.com/rz-admin/node-types), you can create node-types by clicking on Add a node-type. You can export and import a node-type if you have a .json file. See Other action for more information. Upon filling the two mandatory settings Name (that developpers will use) and Display Name (that back-office users will see), you are now ready to create your first node type. Be careful when you name your node-type though, Name field can’t be changed once the node-type is created. See Delete node-type section to know how to delete a node-type. 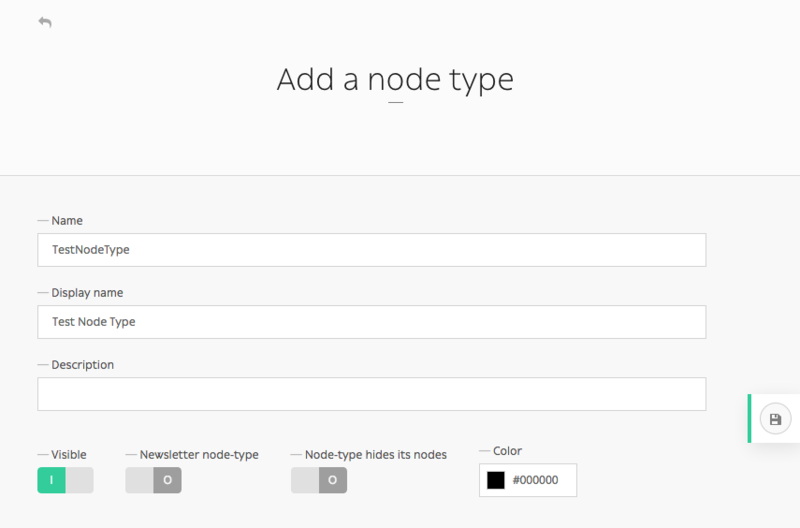 Other options (Visible, Newsletter node-type, Node-type hides its nodes and customizable color) aren’t required and can always be altered later on. You have now created your first node-type! 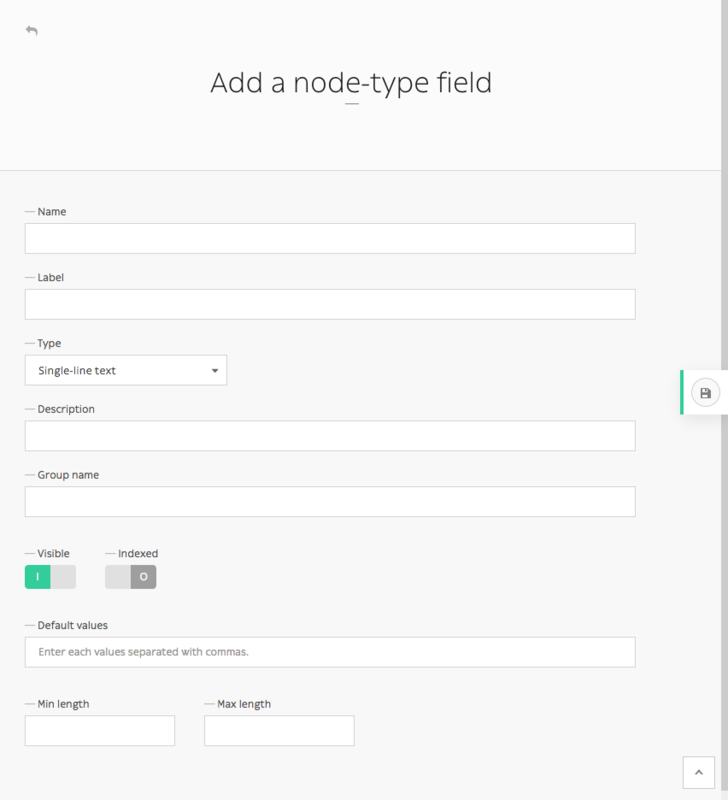 It now appears on the node-type page along other node-types and you can now manage its fields. Made a typo when creating a node-type? No longer in need of a node-type ? You can delete it by simply clicking the trashcan icon on the Node Types page (https://mywebsite.com/rz-admin/node-types). To add fields to your newly-created node-type, click the Manage node-type fields icon. Then click on ‘Add a node-type field’ button. Default values is an interesting field as you can specify what kind of node-types that can be linked to this node-type. You can also use it as a filter in the explorer, and only show those default values. From one website to another, you can export node-types as .rzt files. Notice the three fields that have been added to this Page node-type. You can write an .rzt file yourself if you feel like it, but it is probably easier to simply export node-types from existing website, then import it on your new website. It can be easily done by clicking on Import node-type button, then selecting it via your explorer. You are close to fully master Roadiz’ back-office powers ! Keep refering to this documention if you have any problem, and let us know if any information goes missing. © Copyright 2019, Ambroise Maupate & Julien Blanchet.